My job, heck my life, takes a lot of energy. It is super important to start out with a good breakfast. Here’s one of my favorites to get me going in the morning. 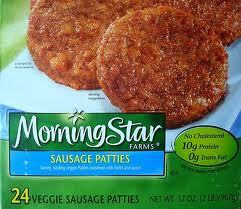 I was super surprised the first time I tried the Morning Star sausage patties. Except that they are greaseless, I would have never known that they are meatless. So delicious!!! Don’t worry about those carbs. You get to subtract the fiber count from the carb count for a new carb total.